This omelet is made from beans! That’s right — it’s totally vean! Chickpea flour whips up to make the batter for this egg-free omelet, but the real magic is black salt, which gives it a surprising and amazingly realistic eggy flavor. Chickpea flour is kind of amazing stuff. It’s the only flour I know of that not only works in baked goods, but also does a pretty darn good job of replicating eggs, as I discovered back when I made this scramble. So yeah, if you haven’t started yet, time to get cooking with some chickpea flour. But there’s more to this omelet than that. The real eggy flavor comes from black salt, also know as kala namak. Open a jar of this stuff and your house will smell like eggs cooking. No kidding. In fact, you know how I just said I’d spit my eggs out as a kid? Well, yeah, I can’t handle black salt in my vegan omelet. It’s too eggy for me. I skip it when I’m cooking one of these for myself, but my husband who used to be the biggest egg head ever (<— So dorky of me. Sorry. ), loves it. 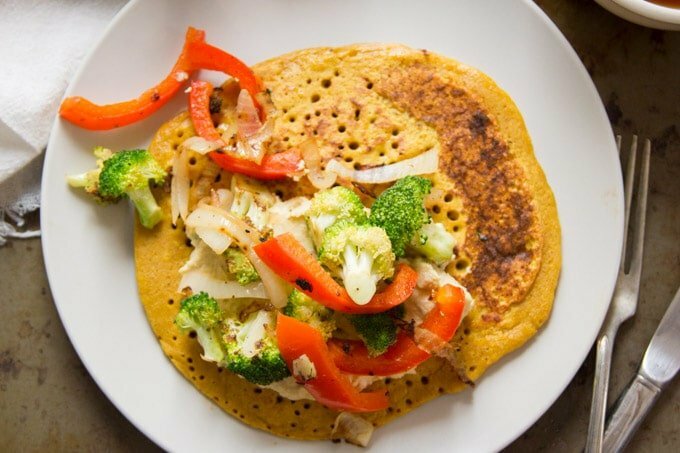 This chickpea flour omelet comes together super easy! First you make the batter which involves, like I said, chickpea flour and black salt, among a few other pantry staples. Mix it up and let it sit for a few minutes to settle. Then you grill up the omelet just like a pancake. The veggies get cooked up in just a bit of garlic and oil. I like to keep them on the tender-crisp side. Plate the omelet and stuff it! I created this recipe to be super simple and easy enough to make during the week. If you happen to be making this on a weekend and want to take the recipe to another level, mix the batter up in the blender and add 1/4 pound of firm or soft tofu, plus a few extra splashes of water. It’ll give your omelet an extra eggy texture. 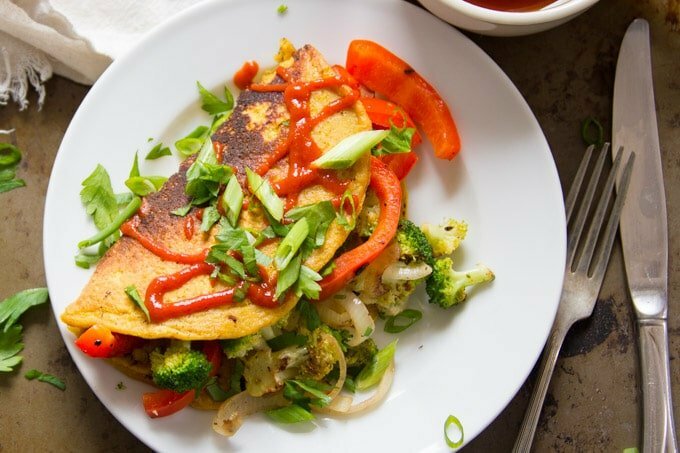 I made my omelet with broccoli and peppers because that’s what I had on hand, but switch it up using your favorites or what is in season. Spinach, mushrooms, and asparagus would all be awesome. I’ve had people ask whether the batter for this can be made a day ahead and the answer is maybe. It can, but the little bit of baking powder in there might lose its fizz, so your omelet could end up a bit less fluffy and more dense. This omelet is made from beans! That's right: chickpea flour whips up to make the batter for this egg-free omelet, but the real magic is black salt, which gives it a surprising and amazingly realistic eggy flavor. In a medium bowl, stir together the chickpea flour, nutritional yeast, flax seeds, baking powder, turmeric, paprika, kala namak and black pepper. Add the water and soy sauce and whisk until blended. Coat a medium skillet with oil and place it over medium heat. Pour half of the batter into the skillet. Cook the omelet until bubbles appear in center, about 4 minutes. Carefully flip and cook it for another 2 minutes. Transfer the omelet to plate. Recoat the skillet with oil if needed and repeat with the remaining batter. Recoat the skillet with oil and raise the heat to medium-high. Add all of the veggies and stir-fry to desired tenderness, about 4-6 minutes. 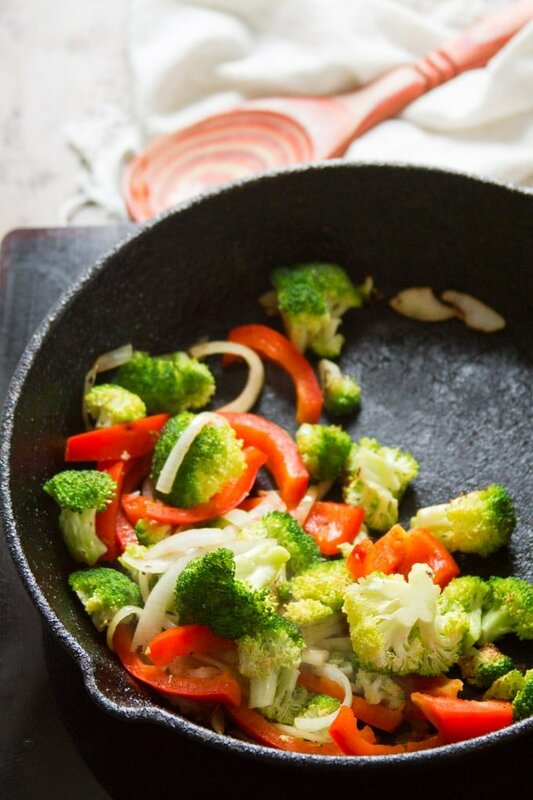 Remove the skillet from heat and season the veggies with salt and pepper to taste. Stuff each omelet with cashew cream cheese and veggies. Fold over and top with toppings of choice. Nutritional information includes omelet and veggies. It does not include accompaniments. I tried it two time and both times it got stuck :( What am I doing wrong? It could be a few things. First, make sure you’ve got a nice coating of oil in the skillet, and re-oil between omelets if it dries up. 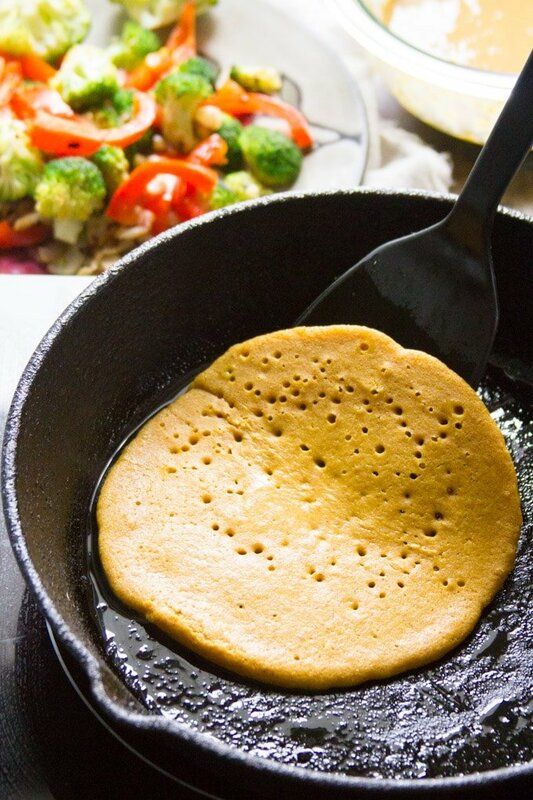 If you still have trouble, try a different skillet – nonstick or some very well seasoned cast iron. Also, make sure it’s fully cooked before flipping. If it feels like it’s not quite sturdy, give it another minutes or two. I hope that helps! Did you use flax seeds or flax meal? Can you make this without the yeast flakes? You can leave them out – the flavor will just be a bit different. Delicious! 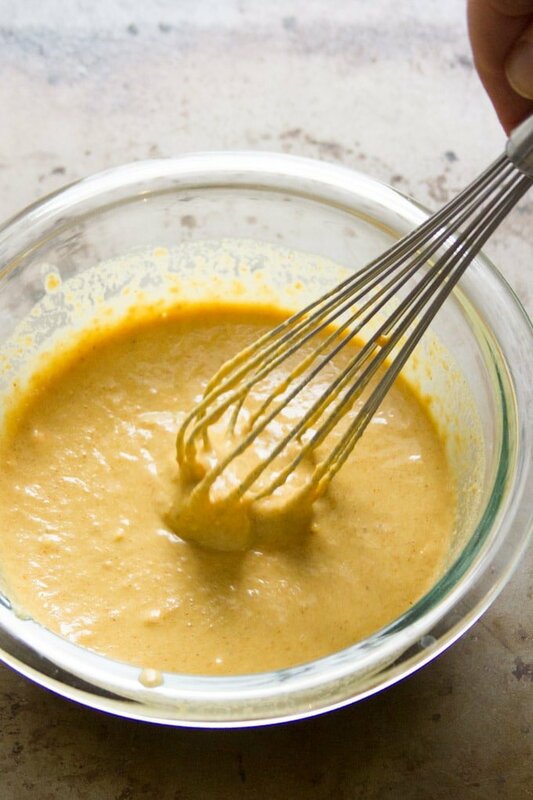 What I tried a couple of times before is making a batter as yours, or with some different spices, just as you like. Then add my leftover veggies and bake them like that is small portions. Tasts great with some chili sauce! Will the pancake (Omelet) component stand up to freezing and then thawing for future use? I think so, but I haven’t tried. This became lunch and got eaten pretty quick! Let me know how it turns out if you try! Enjoy! I have Bobs Red Mill Garbonza and Fava flour is ‘‘tis the same? That one is a mix. I used all garbanzo flour. I’m not sure if that will work. Let me know if you try it! Thanks for the comment! I’m thinking this might work to make my favorite Asian dish from my pre-vegan days: egg foo yung. I’ll have to get right on that. Thanks for the inspiration. Yes! 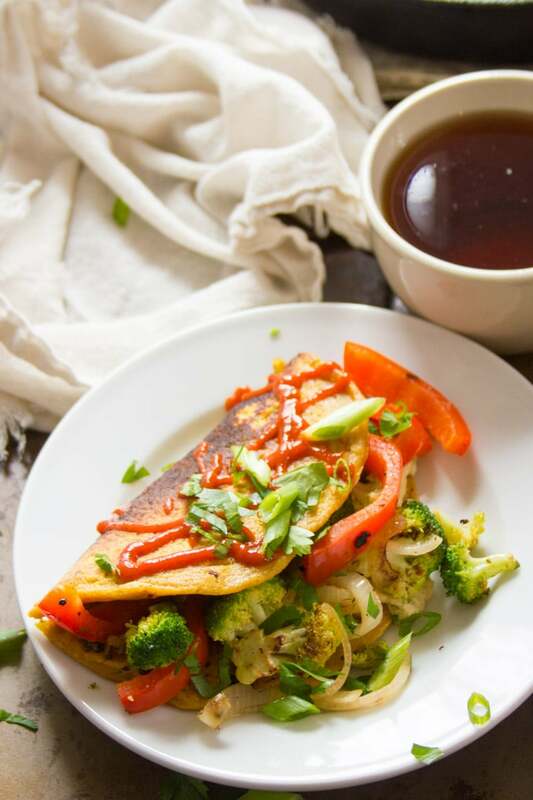 I’ve done egg foo yung with this ‘egg.’ I’ll have to make it again and post it this time! Enjoy! WOW! This was a pleasant yummy surprise, I added mushrooms, red and white onions, and a slice of dairy free cheddar cheese. The first one stuck to pan (fail) but with more oil the second one was perfect! I am a low salt vegan and never heard of black salt before, had to go out and find it and I’m so glad I did! Thanks! I’m so glad that you liked it! The black salt is great for those that miss the authentic eggy flavor. Thanks for the comment! 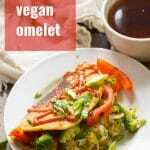 Yum, I bet you could use the Vegan egg yolk/toast dipping sauce over the top on under the omelet if you are one who is missing the “runny egg” thing. Absolutely on my list of recipes to try. Thank you! It’s my favorite recipe. Especially the Veggie Filling, for Broccoli Florets. Thanks for sharing! I’m so happy to hear that! Thanks so much Ronald! Yay!! I’m so glad you enjoyed it!! Thanks Izabela! 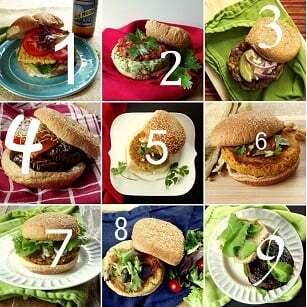 Loved this recipe…used vegan butter instead of the oil and it worked great. Also switched out the broccoli for some mushrooms and spinach…delicious!! That sounds delicious! Im’ so glad you enjoyed it! A friend of mine was actually just telling me this was very similar to an Indian recipe. I had no idea! I’ll have to find a restaurant that has Chilla (or make one myself). Your version sounds delicious! PS. Griddle needs to be very hot. The oil should splutter. This will change Sunday brunch forever lol. This was so good-i added lots of veggies and some chao pepper jack cheese ! I definitely think adding the tofu added to flavor and protein and doubling the flax wass necessary for me to get it to hold together . Be sure and let it sit for full 10 minutes. I’m so glad you enjoyed it!! Thanks Lisa! This is delicious! My spouse wants me to prepare it more often. I had a terrible time with the omelet sticking to the pan. I tried cast iron and stainless steel, and had sticking issues in both. I ended up using way more oil that I would have liked to keep the omelet from sticking. I will have to experiment with ways to minimize oil. Thanks for the recipe. It was delicious! Hi! This looks AMAZING — is it possible to store leftover batter in an airtight container in the fridge? My morning s are busy and it would help to have it ready. I think that will work! I’d stir it a bit just before cooking to incorporate some air into the batter. I’d love to hear how it works out! It worked out beautifully! It took a couple of extra minutes because the batter was cold from the fridge. Other than that, texture and flavor were on point! Thanks for the recipe, we LOVE it. Yay!! Thanks so much for letting me know! This was so delicious! I had some trouble flipping the first one (I need to work on my flipping skills! ), so that will be eaten as a scramble. I used mushrooms, onions, red bell pepper, and spinach. My taste buds thank you and I will definitely make this again. I’m so glad you enjoyed it! And yes! It works great as a scramble – nice save! Thanks so much Donna! I’ve tried this twice now and all I get is a sticky pile of goop☹️ It tastes great though!